Late Tuesday, February 18th in the afternoon a golf cart crashed into the glass display window of Island Supermarket located on Coconut Drive. The green golf cart bearing license plate number SPC 2551 was being driven by 78 year old Graham Whitehead who mistakenly hit the accelerator pedal instead of the brake while headed in the northern direction of Coconut Drive. 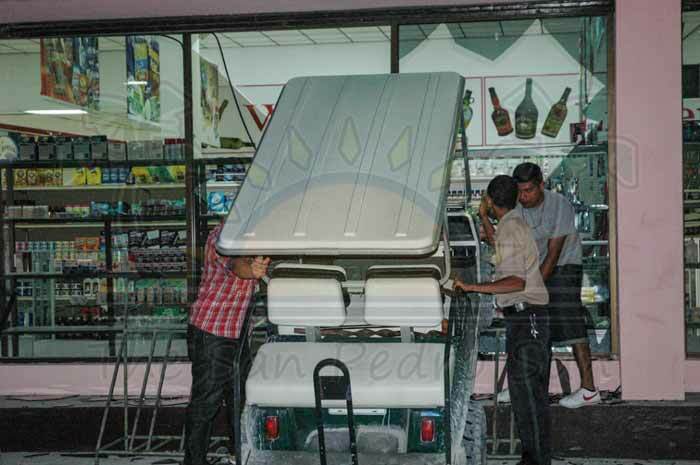 The golf cart was removed from the glass window with the assistance of the shop workers and police officers. Whitehead sustained a minor cut to the left knee and was escorted to the Dr Otto Rodriguez Polyclinic II to check for any further medical conditions. 0 registered members (), 219 guests, and 8 spiders.